Topic: Virgin Mary in Sweden? 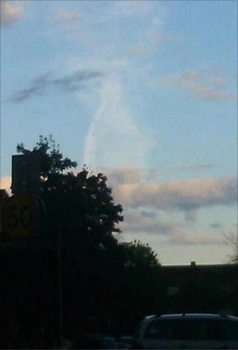 Virgin Mary in Sweden? 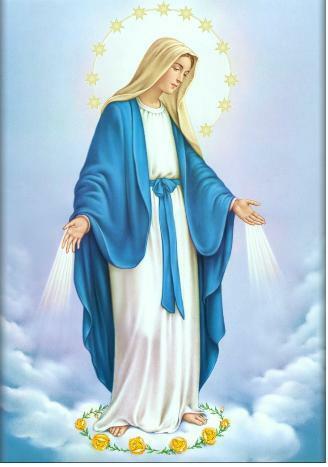 Several persons are said to have seen the Holy Virgin above a Church yesterday (Sunday). “Several of our church members saw St Mary on the roof of our church”, says Teghlat Sauma, Chairman of the Syriac Orthodox Church in Tensta, St Mary Church. This phenomenon is said to have shown itself three times before it disappeared. The St Mary Church had a visitor that day, the Bishop of war-torn Homs (Syria) and in his Cross which he walked around with in the Church hall he had put a few threads said to have come from the Girdle of Virgin Mary (which is in Syria). When the bishop had continued away from there and many people were outside the Church several of them saw Mary. When I ask Sauma about what the vision means, he says that it may have something to do with the new Church. And the situation in Syria. Personally, this is the first time I know of that something like this has happened in Sweden. I know that Syriacs aren’t the types to “see” stuff like this. At least not look for it, and definitely not in Sweden. The more you look at the photo the more it resembles Virgin Mary =P. Maybe it’s the brain. Had to have looked better live and closer up though. Re: Virgin Mary in Sweden? - Several times during the prayer bright lights were seen in the windows and people shouting and a few rushed up there, Teghlat Sauma told after Monday's prayer. - Many were excited and surprised and those who did not previously believe began to believe. Apparently there are some better photos taken by people. If I find any I'll post them. EDIT: I was able to get a connection. New photo from today, they say she appeared again.